Thursday April 18, 2019 Lost Nation Theater officially kicks off 2019 - its 31st Season at Montpelier City Hall Arts Center - with ... The Kick Off Cabaret. 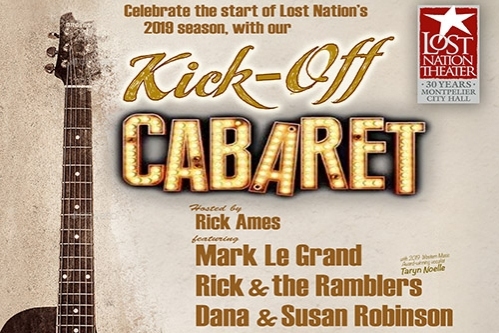 Award-winning, all-time favorite Vermont musicians take Lost Nation Theater’s stage Thursday April 18 for The Kick-Off Cabaret - a benefit concert celebrating the start of Lost Nation Theater’s 31st Season of professional theater in Montpelier City Hall Arts Center. Inimitable, always entertaining Emcee G Richard Ames will guide you as you are treated to the swinging sounds of Rick & The Ramblers – featuring Taryn Noelle who just won the national “Best Vocalist” Award from the Western Music Association; Vermont folk-legends Dana & Susan Robinson; and to indie folk & blues cowboy Mark LeGrand. Making sure hearing them is a treat is sound guru/engineer Bennett Shapiro of Mad Tech Sound. It all happens at Lost Nation Theater, April 18, – and the concert will be on the set of the company’s opening production – The Turn of the Screw (starring Christopher Scheer & Laura Erle – maybe you’ll even get a sneak peek). Sweet Melissa’s will be on hand to provide a cash bar. But more about the performers! Singer-songwriter Mark LeGrand has been performing in Vermont for over fifty years. Currently finishing his seventh recording of original work Mark has recently opened for Rodney Crowell for Catamount Arts and is part of Bess O'Brien’s latest podcast "My Heart Still Beats," on Vermont Public Radio. Dan Bowell's from Seven Days reports "LeGrand cuts his tales of damnation with a chaser of compassion. It's a heady cocktail, equal parts sweet and bitter, stirred to perfection on his latest EP, Wrong Turn." His newest recording "Duct Tape County" is scheduled to be released this spring. From Cabot, Vermont – Americana-roots and folk duo, Dana and Susan Robinson combine vivid, songwriting and storytelling, with fiddle tunes, banjo grooves, elegant melodies, and rich harmony singing. Drawing upon experiences of more than twenty years of touring, Dana and Susan craft a performance that conveys the mystery and wonders of their journey. Their unique blend of original songwriting and traditional Appalachian music, bring to their performances a deep understanding of America’s musical heritage, and how it relates to our contemporary lives. A Rick & The All-Star Ramblers – Western Swing Band performance is a high energy, entertaining and danceable trip back to a Vermont of a simpler, more musical day. A Rambler show is fraught with Vermont-grown original music, classic western swing chestnuts and top-notch musicianship. The Ramblers deliver an exceptional musical experience, loaded with laughs, musical memories, surprises and sweet harmonies. LNT is thrilled to have legendary frontman Rick Norcross and his All-Star Ramblers – Taryn Noelle, Dave Rowell, Ian Koeller, and Doug Reid on our stage. Please join us! Thursday April 18 at Montpelier City Hall Arts Center for the KickOff Cabaret. Curtain is 7:30pm. Box Office and Lobby will open at 6:30pm and seating will begin at 7pm. $20 in advance; $25 at the door. Fun for the whole Family!! or by calling 802-229-0492. Tickets are also available at the Montpelier City Clerks Office (first floor of city hall). Lost Nation Theater is wheelchair accessible and offers assisted listening. Lost Nation Theater winner Best of New England, Yankee Magazine, was named One of the Best Regional Theaters in America by the New York Drama League, winner-Outstanding Achievement Award from the New England Theatre Conference; and has won the People’s Choice awards from both The Times Argus and Seven Days for Best Theater.